June 14, 2011 –We took the back roads from Le Bugue to Cahors arriving in the city via D9 through the little towns of Espere and Mercues. On the way out of Le Bugue we were sidetracked for an hour when we ran into the weekly open air market on Tuesday mornings. It was a wonderful market with plenty of food – olives, foie gras, cheeses, truffles, wine, etc – as well as clothes, jewelry and household items. When we finally got back on the road it took us 1 hour and 20 minutes to drive to Cahors, passing through beautiful countryside and an incredibly charming town along the way called Belves. I wanted to travel to Cahors because it is one of the few French wine areas I have not yet visited. In the Middle Ages it was famous for making “black wine” from the Malbec grape, and is still heralded as the birthplace of Malbec – even though Argentina now reigns as world champion producer of that grape. Interestingly, Cahors was exporting wine long before the Bordeaux wine industry even started. 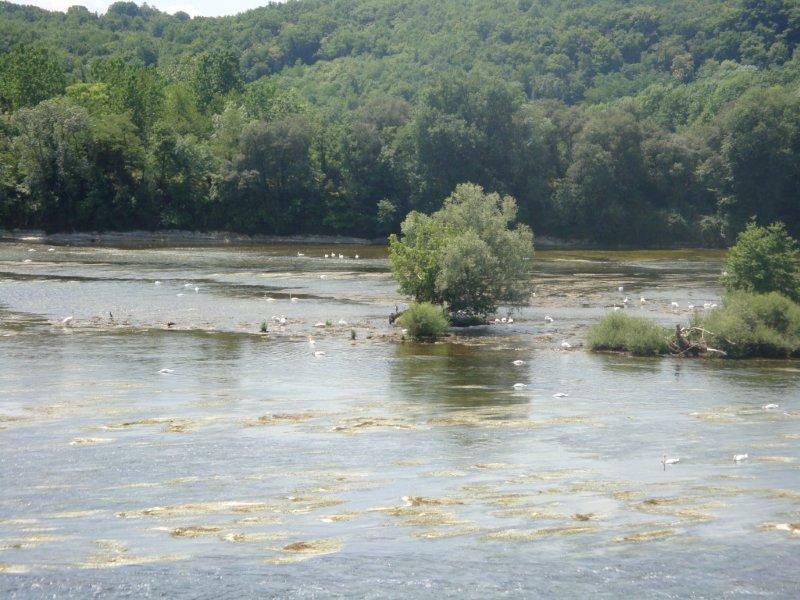 The ancient city of Cahors is situated on a dramatic peninsula in the middle of the Lot River. It was originally settled by the Celts before being taken over by the Romans in 50BC. We actually saw the stones of an old Roman amphitheater when we parked in the garage under Gambetta Square. Also equally fascinating was the beautiful and ancient Valentre Bridge spanning the river with its two towers and curving arches. We had a quick lunch at a sidewalk café before stopping by the Tourist Office for a wine map of the region. They sent us out of the city via Pradines where many of the chateaux are clustered. I asked to visit a large winery, as well as a small one. They called ahead to Cave des Cotes d’Olt to make an appointment for us, and then suggested we just drop by other wineries to see if they were open. The wineries in this region do not charge tasting fees, but she warned that some of the owners may be working in the field as most were small family operations. Caves des Cotes d’Olt is a large cooperative with multiple labels at different prices points. It is housed in an impressive stone building, and was a good place to start as an introduction to the region’s famous malbec grape. The lady operating the tasting room couldn’t speak English, but we managed with my smattering of tourist French. Her first question was whether we liked “pas tannic” or “plus tannic.” I requested that we start with the low tannin reds after tasting some roses. All three malbec roses were delightful with a dry, off-dry, and semi-sweet style. The latter reminded me of a white zinfandel. All three were very refreshing and fruity, under 4 euros per bottle, and would do well in the US market. Moving onto the reds, we tasted through 5 different labels (spitting, of course) starting at 4 euros and going up to 16 euros at the high end. The first Malbec was a 2009 unoaked in a simple and fruity style with smooth, though large tannins. The next three were the traditional black and brooding malbecs of Cahors with earthy notes, dark fruit, huge tannins and a higher acid than Argentinean malbecs. My sister, Michelle, didn’t care for them that much, but I ended up buying the 2002 Le Paradis Cahors which was aged in new oak for 16 months. It won a gold medal at the Challenge International Du Vin Competition and was 14.80 euros. I then asked if we could try another wine with less tannins and the lady brought out a 2010 Demon Noir Malbec which received a gold medal from the 2011 Concours des Feminalise Competition in Beaune (a women’s wine competition!). This wine amazed me because I thought I was tasting a malbec from Argentina or California. It was completely New World in style with very ripe and sweet fruit complemented by big, velvety tannins. The label was also New World with an adorable and quite memorable “demon.” I asked if they were exporting the wine, and she said she wasn’t sure – or perhaps didn’t understand my question. I can’t help but wonder if this is one of Cahor’s competitive responses to the tidal wave of Argentina sweeping the world. Michelle loved it and immediately bought a bottle for the very nice price of 4.80 euros. After leaving Cotes d’Olt we drove around the small roads winding through the malbec vineyards trying to decide which chateau to visit next. There were many choices with good signage pointing towards charming limestone houses surrounded by flowers. Finally we decided on a group of 3 wineries making wine in one location near the River Lot -- Chateau St. Didier, Chateau de Grezels and Prieure de Cenac. Walking into a large room with a sign that announced “Degustation and Vente de Vin” (wine tasting and sales), we were greeted by a nice lady who led us to the tasting bar and poured 4 wines from the 3 estates, with the 4th being a rather expensive special vineyard selection. All of the wines were in the traditional Cahors style with massive tannins, dark fruit, and truffle notes…but I was impressed with the fragrant berry nose of all the wines. I ended up buying the 2007 Chateau de Grezels Cahors for 5.80 euros. It was aged in oak for 12 months and was a selection of the 2011 Le Guide Hachette Des Vins. The whole conversation was again in French, but we were able to understand that 20 to 30% merlot had been added to the wines. Later I checked the official percentage of malbec that is required for Cahors and found it is 70% minimum, but wineries are allowed to add up to 30% of merlot and/or tannat. The vineyards around the chateaux appeared to be wider spacing than Bordeaux – perhaps 4 by 6 feet with a single caned pruned arm (guyot). The vines were allowed to grow quite high for France – at least 5 feet. I wasn’t sure if this was because of the vigor of malbec (if often needs a kicker cane because it grows so fast), or because they just hadn’t had a chance to trim them yet. If we had more time, I would have done more research and made advance appointments with someone who could have explained the vineyards, but I wasn’t even sure we were going to get to Cahors. Now I am very glad we came. It is a charming, beautiful, and non-touristy area which is enjoyable to visit. June 12 – 15 – We departed Bordeaux around 10am on Sunday morning taking the toll way to the Montignac exit – one of the entry points to the Dordogne region. We arrived just before noon and were completely enchanted with the charming little town decorated with flower streamers above the streets. We found a quaint restaurant with outdoor tables along the river, and proceeded to order a foie gras salad and a half a carafe of Bergerac Blanc – made primarily of sauvignon blanc and muscadelle. After lunch we wandered around the town and found an ice cream shop with an amazing assortment of flavors including rose, violette, and pampelmouse rose (pink grapefruit) – which I ordered. We purchased our tickets for the Lascoux prehistoric caves and found we had a couple of hours to spare, so we drove a few kilometers to the Chateau de Losse. Chateau de Losse is an ancient castle on the river, built in the 1300’s, complete with moats and beautiful formal gardens. Cost was $8.50 euros per person. We viewed the gardens and fountains first, before touring the castle with a French speaking guide. Helpfully they provided us with an English brochure so we could understand what was being communicated. The rooms of the castle were beautifully decorated in antiques and every effort had been made to renovate it authentically. One of the major tourist attractions of the Dordogne are the many prehistoric caves sprinkled throughout the region. We had Rick Steve’s Travel Guide 2009 with us, so we decided to take his advice and go to Lascoux II first. It is an exact reproduction, including humidity and temperature, of the original Lascoux I caves which are now closed to the public due to damage that was caused from too many visitors breathing on the paintings. We had registered for the 2:30pm English tour for $8.50 euros. Wearing sweaters we followed the guide down a flight of stairs into the two caves. It was definitely chilly inside, but as the tour only lasted 40 minutes it was not that bad. Our guide began with the story of how the caves were discovered by 3 teenagers and their dog in the 1940’s. The dog chased a rabbit and accidently fell down a hole. When the teens went to rescue him they found a passageway into the caves. The walls are covered with more than 100 paintings of horses, bull, deer, and other animals. Our guide did a great job explaining how they were developed over the centuries and pointing out the exquisite craftsmanship needed to paint such large scale paintings more than 15,000 years ago. We were very impressed, and I would highly recommend the tour. There are also several other caves nearby with original, rather than reproduced paintings, but none are as large or complete as Lascoux. After the cave tour, we drove 40 minutes on a small road along the river that passed many historic sites. At one point we stopped at a foie gras farm with over 100 geese in a large park like setting. They encourage visitors to go on tours to show that the geese are not treated inhumanely, and that every part of the goose is used – including feathers, meat, and foie gras liver. Eventually we came to the small village of Le Bugue where our hotel, Vacanes Residences (only $69 per night on Hotels.com) was located. It took several telephone calls before we found it on the outskirts of town surrounded by rolling hills. It is a charming family oriented apartment complex with large sunny pool. We had 2 separate bedrooms upstairs and a living room/dining room with outdoor patio complete with table and umbrella. The only thing they forgot to mention is that we had to rent towels and sheets. Despite that, we enjoyed our three nights there. After unpacking and taking a nap, we headed into town for dinner around 8:30pm, but made the mistake of stopping for a pastis at a river side bar in Limuel. By the time we looked for a restaurant, they were all closing at 9:30pm. I had forgotten how much France shuts down on Sunday. After being turned away from the 4th restaurant, the lady took pity on us and gave us directions to a take-out pizza parlor. So our first night in Le Bugue, we had pizza and a great bottle of 2009 Chateau Baron Le Mayne, AOC Bordeaux wine in our outdoor patio. It was my first taste of the legendary 2009 vintage, and even though it was an inexpensive wine, it was very fruity, full-bodied, with good length. Michelle said it was her favorite red Bordeaux of the trip….but then, it was a 2009! June 13, 2011 - Per Rick Steve’s book, we took his advice and booked a boat tour at Beynac. It was one of the highlights of the trip as we were able to see 4 castles from the Dordogne River within one hour. Afterwards we had a very nice prix fixe lunch at LaRiveria Restaurant overlooking the river in Beynac. We copied all the French families eating there and ordered a wonderful half bottle of Bergerac Rose. After lunch we drove to La Roque and marveled at how the city was built into the cliffside. As the day was getting quite hot – in the high 80’s – we went back to our apartment for a lazy swim in the pool and nap. Then we drove to Sarlat and followed Rick Steve’s walking tour of that amazing medieval city. He said to visit most of these places in the evening as they are less crowded and cooler. He was right! Sarlat had to be one of the most beautiful ancient cities I’ve ever seen. There were so many charming restaurants – all decorated in pink, yellow, or orange tablecloths with glowing candlelight -- that it was almost impossible to pick one. But we eventually did and had a great fish meal with a bottle of 100% Semillon Bergerac blanc. June 14, 2011 – the next day we attended the wonderful Farmer’s Market in Le Bugue and then drove to Cahors (see post below). On the way back, we stopped for a drink in the hilltop walled town of Le Domme and Michelle swore she would come back some day and stay in the hotel on the cliffs. Next we drove the few minutes to Castlenaud – another amazing ancient castle on the cliffs, and then ended up back in Beynac for a wonderful dinner on the river again. This time I had goose gizzard, which was surprisingly filling and reminded me of beef stew. After dinner we walked around the deserted Beynac castle and gasped when a full moon rose up over the valley and walls. We had the whole magical landscape to ourselves, and it felt like we had fallen into a fairytale. June 11, 2011 – We slept in on Saturday morning, then drove to downtown Bordeaux to park in their underground parking structure. Then we had brunch at a charming sidewalk café before boarding the bus which headed to the Medoc for a tour of two wineries. When we saw the names of the wineries – Gruaud Larose and Maucauillou – people laughingly said they must have selected the two most difficult winery names to pronounce. Most marketing textbooks recommend selecting a product name that is easy to spell and pronounce, but this is not always the case in Bordeaux. This chateau, located in St. Julien, was started in 1725 and has 80 hectares of vines. We started in the vineyard and enjoyed see the gravely soil and learning that the grand cru is only created from old vines (25 to 80 years of age). In the cellar, they use concrete tanks for primary fermentation with 2 pump-overs per day for the first 9-10 days and a total of 23 days for maceration. Secondary fermentation takes place in large oak foudres for the grand cru. Interestingly they blend everything after fermentation and then age 16 months in 70% new French oak barrels, topping every 2 weeks and racking every 3 months. In the tasting room, I was surprised to see that they are selling some wine direct to consumer – but you must make an appointment to visit, as is the case with most Bordeaux grand cru chateaux. We tasted 2 wines, beginning with the second label, Chateau Sarget 2002. It had a ripe cassis nose with dark fruit and earth on the palate. It was a medium-bodied wine, lightly oaked with a medium to long finish. Good for food, and still rather astringent for a 2002. The next wine was my favorite -- Chateau Gruaud-Larose 2001. It was nice they let us taste some of the older vintages. 2001 is usually over-shadowed by the brilliant 2000, but it is still quite enjoyable. This wine tasted very fresh, and still has 8-10 more years in the bottle. It was a dark red opaque color with a dense fruit nose and tobacco, earth, toast, and gravel edge on the palate – very complex, good intensity, well-balanced, and long finish. It was instructive to see and taste how careful sorting of grapes and different winemaking distinguishes the grand cru from the second label. Chateau Maucauillou was started in 1871 in the Moulis region. It is considered to be a “Cru Bourgeois,” though the designation has now been dropped in Bordeaux. Regardless this distinction indicates it is of higher quality than a generic AOC Bordeaux. The first impressive I received upon entering the estate was one of delightful whimsy reflected in the large bronze bull on the lawn in front of the country-house chateau and the two roosters on the entry sign shaped from a large black ball (see photo). After disembarking from the bus, we had to wait 15 minutes for our tour guide who was running behind schedule, however she did provide an informative and quick tour of the cellars. A unique aspect of their winemaking is that they ferment in stainless steel at rather low temperatures for Bordeaux red varietals – approximately 21 degrees Celsius – which is a technique usually adopted for pinot noir and zinfandel, rather than cabernet sauvignon and friends. The purpose is to maintain the fresh fruit aromas and notes in the wine. They also construct the blend after aging individual lots for 18 months in 100% new French oak barrels. As this was my first time to taste this brand, I was disappointed to find they only opened the 2007 Chateau Maucauillou -- my least favorite vintage. Though it did start with a beautiful nose of ripe berries (most likely from the cool ferment), it did not follow through on the palate. Instead we were greeted with a medium-bodied wine with high acid, astringent tannins and a bitter finish. Hopefully I will be able to try this wine on another occasion with a better vintage. After the tasting we had time to visit the wonderful wine museum, which is a special feature of Chateau Maucauillou. Definitely worth the time!